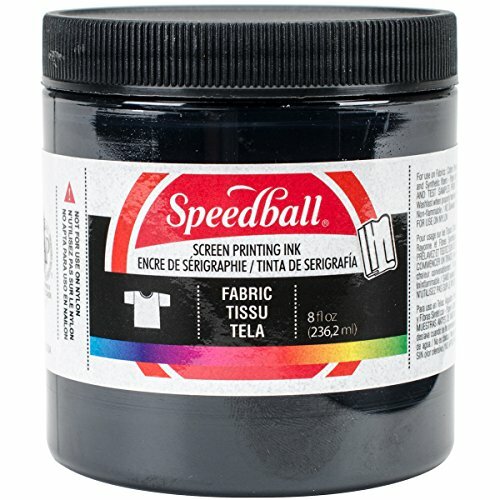 Speedball Water Soluble Screen Printing Ink Set in assorted comes in a jar of 4 oz capacity and is used with paper and cardboard. Set of 6 includes red, yellow, blue, green, black and white colored inks. Ink with no solvent and offensive smell dries rendering smooth matte finish. Non-flammable ink can be screen printed or painted on with a brush offering fantastic coverage and smoother workability. Ink can be cleaned up easily with water. 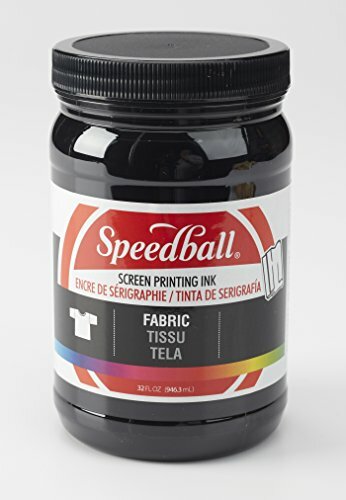 Speedball water-soluble screen printing inks are made for printing on paper and textiles. Non-flammable, non-toxic and cleans up with soap and water. For greater transparency or economy, use colorless extender. This package contains one 8 ounce jar. 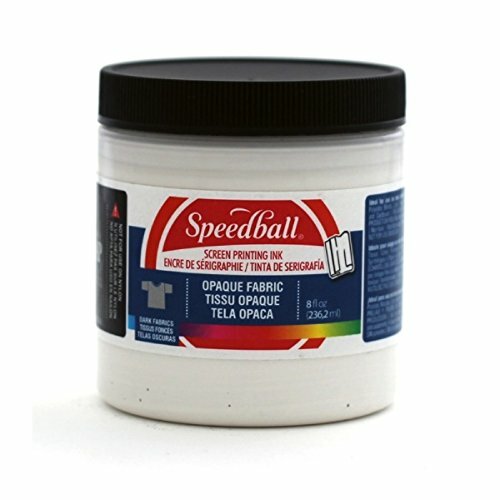 Speedball opaque metallic screen printing ink- pearly white metallic. This unique screen printing ink will add shine and luminosity to your projects! each color in this Series dries to a finish that looks like brushed metal. The inks themselves are water based non-toxic and non-flammable. Suitable for t-shirts tablecloths- almost any fabric applications. They can also be used on paper and board. Simply clean up with water! for permanency on fabric inks must be heat set. This can be done with a household clothing iron- set the iron for the type of fabric used and iron for 3-5 minutes on each side of the garment. These inks have a wonderful metallic to pearlescent quality and they shift color slightly when viewed from different angles. 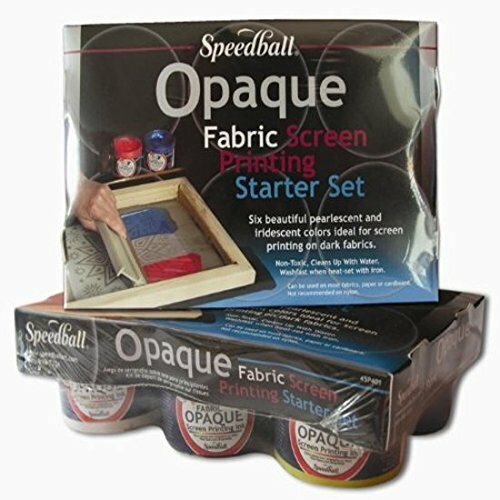 This opaque fabric screen printing ink starter set includes 6, 4-ounce jars of silver, raspberry, blue topaz, citrine, pearly white and black pearl opaque fabric screen printing ink. These inks are iridescent and ideal for use on dark fabrics of cotton, polyester, blends, linen, rayon and other synthetic fibers, as well as paper or cardboard (not for use on nylon). Inks can be screen printed or painted on with brush and cleans up easily with water. Wash fast when properly heat-set. Non- flammable, no solvents and no offensive smell. AP non-Toxic conforms to ASTM D-4236. Archival qualities. Made in USA. 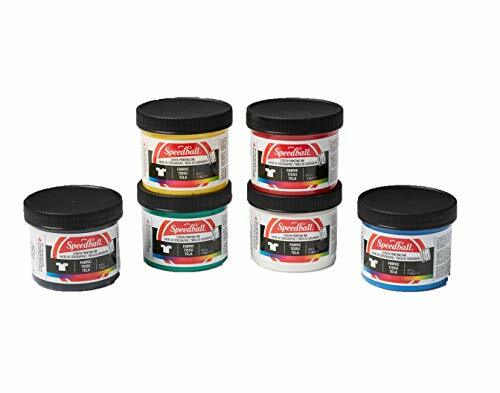 This fabric screen printing ink starter set includes 6, 4-ounce jars of black, red, blue, white, green and yellow fabric screen-printing ink. These inks are ideal for use on cotton, polyester, blends, linen, rayon and other synthetic fibers, as well as paper or cardboard (not for use on nylon). Inks can be screen printed or painted on with brush and cleans up easily with water. Wash fast when properly heat-set. Non- flammable, no solvents and no offensive smell. AP certified; conforms to ASTM D-4236. Made in USA. The Jacquard Opaque Colors Screen Printing Kit features professional screen printing inks accessible to both beginners and experienced printers. These inks have longer open time in the screen in comparison to other water-based products, making them ideal for small production runs. They work well with multiple surfaces such as fabric, canvas, wood, paper, plastic, leather and vinyl. 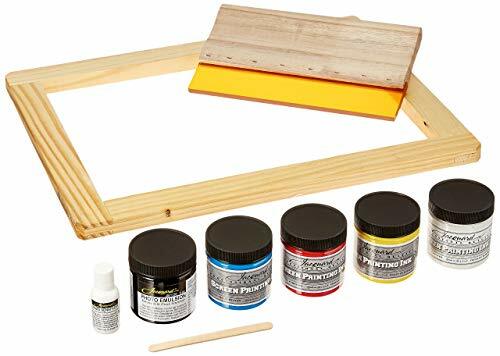 The kit includes a pre-stretched silk screen with wood frame, wood-handled squeegee, photo emulsion and diazo sensitizer, 4 jars of Jacquard Professional Screen Inks, a stir stick and instruction booklet. The Opaque Colors Screen Printing Kit is great for printing on dark backgrounds. Make your own art prints, cards, wearable art and more! This acrylic screen printing ink starter set is perfect for 4-color process print design. 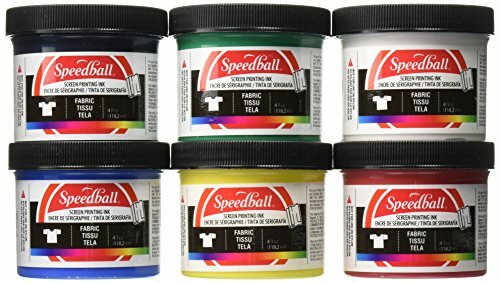 Set includes 4, 4-ounce speedball permanent acrylic screen printing Inks in process colors yellow, cyan, magenta and black. These acrylic inks are ideal for printing on paper, wood or cardboard and can be screen printed or painted with a brush. Non-flammable, contain no solvents and clean up easily with water. AP non-Toxic conforms to ASTM D-4236. Archival qualities. Made in USA. 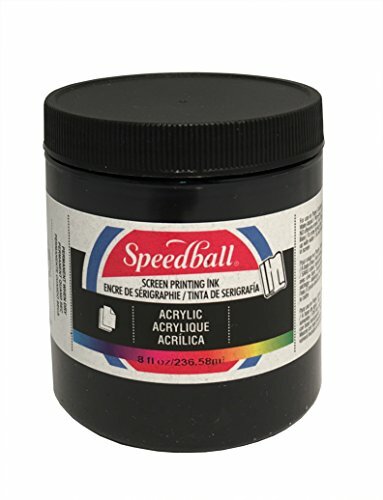 Speedball Acrylic Screen Printing Ink black 8 oz. Shopping Results for "Screen Printing Ink"